Agricultural intensification is one of the major drivers of global environmental degradation. Its impacts on birds, past, and present(especially farm birds such as red wings, blackbirds, starlings, grackles) are well known and include population declines in Europe and North America... of bottom feeding fish too. These are indicator species. Or could it be HAARP? Chemical damage from the BP disaster? ALBUQUERQUE, N.M. (KRQE) - It sounds like something out of a Hitchcock movie, birds falling from the sky. A woman found more than half a dozen dead crows in her yard and whoever is killing the birds could face federal charges. The woman believes the crows were poisoned. Crows are a protected species and now the hunt is on to find whoever is responsible. The Northwest neighborhood near Second Street and Osuna is eerily quiet except for during the early morning hours when Kathleen Brem says she hears a terrifying noise. "Screaming, they're rolling trying to I guess deal with the pain," Brem explained. "To me I could see they were being poisoned." Brem says seven crows died in her yard in just seven days. She explained she watched them seize, struggle to walk then pass out. In November of 2011 KRQE News 13 reported about a similar incident that happened near Uptown. Investigators determined those crows were poisoned. They died in the same way. Crows are protected by the federal Migratory Treaty Act. Killing a crow is a federal crime, unless that person has a permit. For Brem it's just hard to watch. "It's painful to see it. There's no living being, no animal that deserves to have that kind of death," Brem said. Now she's worried about side affects. "If my dog gets curious or my cat does and these creatures are poisoned, I'm afraid that they might sicken or even kill my pets," Brem said. The birds have to be tested to see if they are being poisoned. The case will be investigated as an animal cruelty case by the city animal welfare department. The city of Albuquerque told KRQE News 13 under no circumstances would they poison birds even if they're becoming a nuisance. Poisoning a crow is punishable with up to a $10,000 fine and/or jail time. Why, oh why are permits given to these foolish farmers to poison the birds over a couple thousand dollars of crops lost. Animal feed-lots are another issue. That is why there are crop insurance subsidies given to, and paid for by US tax-payers to any farmers with crop loss. That is bunk that I am paying other farmers to kill off the birds through subsidy pay-outs. In our neck of the woods/farm, birds are needed as a natural control of insect pests. They feed on the wild grains/seeds/ as well as sunflowers planted that WE LEAVE growing around the farm/gardens. Local officials said Tuesday that a poison that poses no risk to humans or pets is believed to be the cause of a large bird die-off in Yankton. This one is interesting.......Anyone know about this theory? The working theory in all this, at least for the birds, is that deadly space clouds are reaching into the lower atmosphere and killing these birds in flight. Hydrogen Cyanide is also formed in interstellar clouds through one of two major pathways: via a neutral-neutral reaction (CH2 + N -> HCN + H) and via dissociative recombination (HCNH+ + e- -> HCN + H). The dissociative recombination pathway is dominant by 30%; however, the HCNH+ must be in its linear form. Dissociative recombination with its structural isomer, H2NC+ produces hydrogen isocyanide (HNC), exclusively. 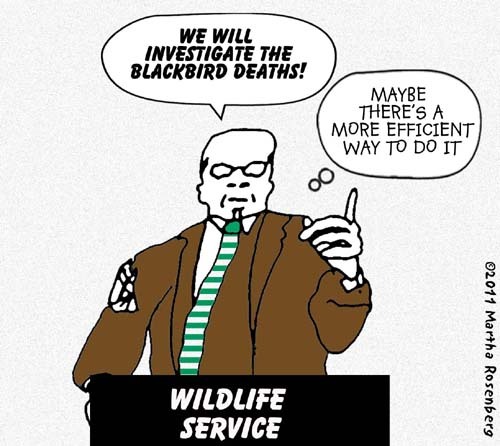 Do wildlife officials feel just a little hypocritical answering media questions about the New Year’s Eve blackbird “rain” when they know they kill 200 times that amount a year as “pests”? The black carcasses of dead starlings still pepper the snowy roads and lawns of central New Jersey’s rural Griggstown community three days after federal officials used a pesticide to kill as many as 5,000 of the birds. The U.S. Department of Agriculture called local police last week and the Somerset County Health Department to warn them that a culling program was under way, but there was no notice that dead birds could fall from the sky, Levine said.Carol Bannerman, a USDA spokeswoman, said a bird-specific pesticide called DRC-1339 was used to kill the starlings. It is harmless to people and other animals, she said. Bannerman said the starlings had to be killed because they were plaguing an area farm, where they were eating feed meant for cattle and chickens and defecating in feeding bowls. “We’re very sorry that it played out the way that it did,” Bannerman said. She said the USDA will try to do a better job of notifying the public in the future. Federal employees dispensed the pesticide on Friday. Birds that ingest it usually die within three days, Bannerman said, so the die-off should have run its course by Monday. The DRC-1339 pesticide is commonly used to protect farms and feedlot operations from European starlings, which are considered an invasive species by the USDA. One hundred starlings brought to the U.S. in 1890 have grown into the nation’s most numerous bird species, Bannerman said.